« Beautiful Morning On Taney! Pick A Few Here, Pick A Few There! Weather is pretty warm. 90s today and again tomorrow. Thursday is supposed to start cooling down a little; into the upper 80s, then mid to low 80 by next week. Even a slight chance rain by next Monday. The generation pattern continues to be off in the a.m. until 2:00 p.m or better, then 2-3 units turned on for just a few hours. Saturday, Stan took Tom and Bob out just about 30 minutes before they fired up three units. The guys were in a meeting all morning but wanted to get in some fishing time. 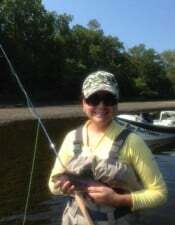 Tough time with the heavy, dirty water, but they managed to pull out a few fish on the big ruby midge on a quick float. They also had to be off the water earlier than normal. Steve and Jim, from California spent most of the day on the water with Stan Sunday. Good day for these guys on the copper dun & P&P midges. The water stayed off until 3:00 p.m. and they rowed back up to the put-in and called it a day. Jim on the river today with Jim from Texas. Not a bad day on the size 12 olive wooly bugger, a coppier dun midge and a blood worm dropper. fishing expedition. Gotta say, she did outfish Michael. But, in Michael’s defense, Gina got all the help. Michael hooked a couple on a size 12 BH olive bugger. The midge patterns were switching back and forth based on the fog. When the fog rolled in, copper dun. When the fog lifted, P&P. Gina also caught a couple on a red holographic crackleback stripping it in the shallows. 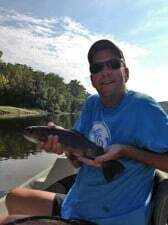 This entry was posted on Monday, September 9th, 2013 at 5:32 pm	and is filed under Fishing Reports. You can follow any responses to this entry through the RSS 2.0 feed. You can leave a response, or trackback from your own site.